Miami Trace senior Tori Riley (42) puts up a shot over Clinton-Massie senior Sydney Leary (24) during an SCOL game at Miami Trace High School Wednesday, Jan. 11, 2017. 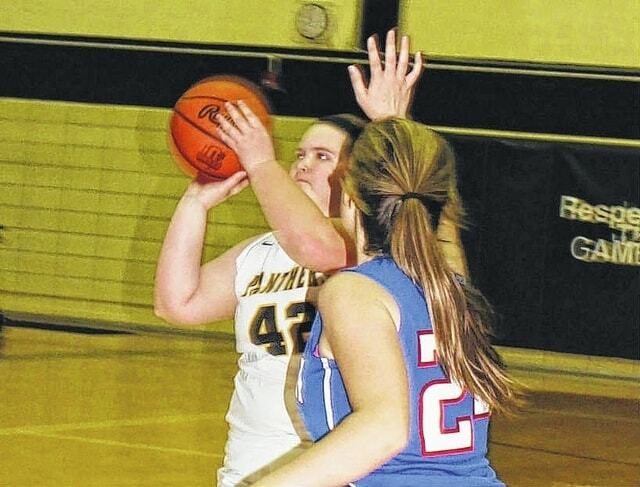 The Miami Trace Lady Panthers hosted Clinton-Massie for an SCOL match-up Wednesday night. The Lady Panthers hit eight three-point field goals and went 9 of 10 from the line on their way to a 57-28 victory. Miami Trace (12-0, 8-0) was led by junior Tanner Bryant with 16 points. Bryant hit two threes for the Lady Panthers and let her team with six rebounds. Junior Victoria Fliehman scored 15 points, with three three-point shots made. Senior Hanna Reisinger hit two threes for six points and led Miami Trace with five assists. For Clinton-Massie, sophomore Faith Cottrell led with 14 points. She connected on all four of her team’s three-point baskets. After a close encounter with the Lady Blue Lions of Washington on Saturday, Miami Trace has been getting after it in practice this week. “We had two very challenging practices Monday and Tuesday and I think our kids woke up a lot,” Miami Trace head coach Ben Ackley said. “We were just disappointed in our effort Saturday, so we challenged our kids and they really responded well. We had, probably, two of the hardest practices we’ve had in my five years here. “I thought tonight our balance was the big key,” Ackley said. “It started with Cassidy Lovett. She was absolutely unbelievable out front. Both times we’ve played Massie, their guards have had a lot of trouble with Cass out front. We missed a few shots early, but she got us in transition and created a bunch of turnovers. I was very pleased with everybody. It was a bit of a slow start for both teams in front of a nice weekday crowd. Clinton-Massie got on the board first at the 6:15 mark on a pair of free throws by Madilyn Newton. Fliehman tied the score and Bryant hit a three to give Miami Trace a 5-4 lead. The Lady Falcons scored with four minutes remaining in the first quarter for a 6-5 lead. It would be the visitor’s final lead of the game. At the end of the first quarter, Miami Trace was in front, 16-8. Miami Trace went on a 13-0 lead to start the second quarter, including back-to-back threes from Fliehman, two baskets from Bryant and a bucket from senior Samantha Ritenour. At the half, Miami Trace was in front, 34-14. During the intermission, the crowd was treated to a scrimmage featuring members of the Miami Trace fourth grade travel team. In the third quarter, Miami Trace outscored Clinton-Massie, 15-9 to stretch the lead to 49-23. Miami Trace led by as many as 31 points with 2:37 to play after a three by Reisinger before Clinton-Massie scored the final basket of the game to reach the score of 57-28. “Miami Trace is a well-oiled machine,” Clinton-Massie head coach Tim McGraw said. “We knew coming in they were going to press us and get after us. Contrast that number with what could be a season-low of just six turnovers for Miami Trace. Clinton-Massie (5-7 overall and 1-6 in the SCOL) will be back in action Saturday at Hillsboro with the j-v starting at 5:30 p.m.
Miami Trace is back in action Saturday at home against Wilmington with the j-v game starting at 5:30 p.m. Elsewhere around the SCOL Wednesday, Chillicothe defeated Washington, 66-53, East Clinton beat Hillsboro, 50-23 and Wilmington topped McClain, 47-36. MIAMI TRACE —Olivia Wolffe 0-1-1; Cassidy Lovett 1-2-4; Becca Ratliff 0-0-0; Hanna Reisinger 0 (2)-0-6; Shaylee McDonald 1 (1)-2-7; Morgan Miller 0-0-0; Victoria Fliehman 2 (3)-2-15; Tanner Bryant 5 (2)-0-16; Tori Evans 0-0-0; Samantha Ritenour 1-2-4; Tori Riley 2-0-4. TOTALS — 12 (8)-9-57. Free throw shooting: 9 of 10 for 90 percent. Three-point field goals: Fliehman, 3; Reisinger, 2; Bryant, 2; McDonald. Three-point field goal shooting: 8 of 21 for 38 percent. Combined field goal shooting: 20 of 53 for 38 percent. Turnovers: 6. Rebounds: 27 (10 offensive). Assists: 13. Steals: 12. Personal fouls: 9. CLINTON-MASSIE — Emily Ireland 0-0-0; Johanna Theetge 0-0-0; Faith Cottrell 1 (4)-0-14; Brooke Rose 0-0-0; Haley Conley 0-0-0; Alana Smith 0-0-0; Piper Hurlburt 0-0-0; Sydney Leary 3-0-6; Ashlie Miller 0-0-0; Hannah Doss 0-0-0; Madilyn Newton 1-2-4; Savannah Myers 2-0-4. TOTALS — 7 (4)-2-28. Free throw shooting: 2 of 7 for 29 percent. Combined field goal shooting: 11 of 27 for 41 percent. Three-point field goal shooting: 4 of 10 for 40 percent. Turnovers: 27. Offensive rebounds: 6. In the j-v game Wednesday, Miami Trace defeated Clinton-Massie, 29-18 to improve to 10-2 overall, 8-0 in the SCOL. Tori Evans was the game’s leading scorer for Miami Trace with 12 points. Becca Ratliff scored nine, Lena Steele had three, Aubrey McCoy and Olivia Wolffe both had two points and Aubrey Schwartz scored one. For the Lady Falcons, Hannah Doss, Patience Chowning and Gabby Woods each scored four points, while Ashlie Miller, Nina Lazic and Haley Conley each had two points.